Learn about a simple, but effective way to get fit. Have you been looking for a manageable but effective fitness challenge to help you get in shape? Starting a workout program can be tough to fit in around the craziness of daily life. It is easy to keep putting it off indefinitely–telling yourself that you will “start tomorrow” … but tomorrow never comes. If this sounds familiar, then we have the 30 day fitness challenge you’ve been looking for. With this fitness challenge you can start getting in shape today – no equipment or membership required. Start getting fit one step at a time! The pedometer is the perfect fitness tool for those of us with busy lives. It provides a subtle, but effective, means of pursuing a healthier lifestyle. The key to being healthy isn’t dramatic diets or extreme workouts. It is a comprehensive and integrated approach to wellness–and the pedometer encourages just that. People who use pedometers find themselves walking more each day and each week–rather than a sporadic trip to the gym here or there. Buy a Pedometer: Find and buy a pedometer to suit your needs. Pedometers can range from very simple to fairly sophisticated. You can choose from one that simply counts your steps or one that provides more information like: miles walked, calories burned, your heart rate, etc. Do a Test Run: Before starting your challenge, wear the pedometer for a day (or a few to get a better average) to see how many steps you normally walk. 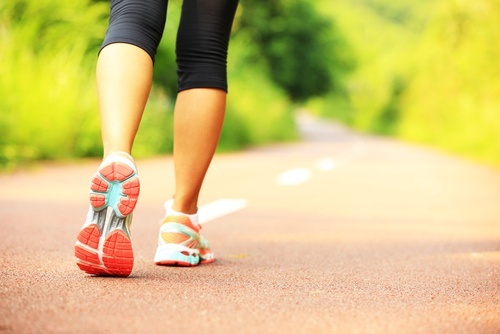 Set a Goal: The recommended number of steps per day for a healthy lifestyle is 10,000. The average American walks 3,000-4,000. If you are in this range, 10,000 may be a good goal to start with. If your count is a lot lower, you may want to start out with a goal a little lower. Or, maybe you already walk 10,000+ per day and want to set it even higher! Whatever the goal is, make it reasonable, considering where you are at currently–you can always do another 30 day challenge and set a higher goal! Calculate the Increase Per Week: Determine how much you will need to increase your steps each week to reach your end goal, and use that to create weekly goals. For example, if you currently walk 4,000 steps per day, then you need a total increase of 6,000 steps. That means you need to add 1,500 steps per week. With this simple 30 day fitness challenge you will find yourself making small changes that will add up to make a big difference in how you feel each day. You will discover that taking the stairs instead of the elevator, parking on the far side of the parking lot, and taking the long way to the bathroom can really add up. If you feel good at the end of this fitness challenge, set a new goal and keep going! To learn more about pedometers and wellness programs, contact Wellworks For You today. And, be sure to check out our Recipe eBook for nutrition tips to complement your new approach to fitness!